Welcome To The Link Fairy 2011 Holiday Gift Guide! When your kids and family members seem to have everything under the sun, its hard to think of Â something else you could possibly give them! Trust me, I know the feeling! Sometimes, looking for that perfect gift during the Holidays can seem down right hopeless! Look No Further My Friends! 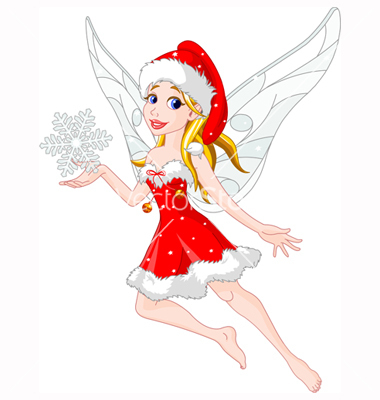 The Link Fairy has spread her wings and come to save all of you dreary gift searchers! Come, Follow me to a land of proven happiness and easyÂ decisions! Through trial and tribulation I’ve chosen 10 of my favorite, under the tree worthy products to share with you and show their inner workings! Be Sure and Read through the picks and look for the DEAL & GIVEAWAY ALERTS! There are Giveaways and Exclusive Link Fairy Only discount codes! I had been looking for a Kitchen for quite some time for my kids. With SOOOO many choices out there, picking one was certainly a chore! I had seen the big, the small, the ones that looked like fun little market centers with shelves to display fake goodies and ones that rival what I wish was my own dream kitchen! 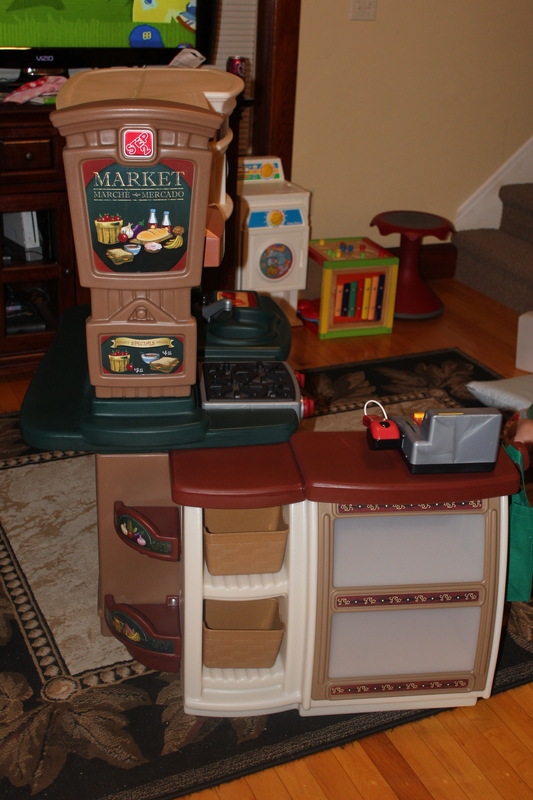 After extensive searching I finally stumbled upon the Fresh Market Kitchen from Step2! Could it be? a Kitchen and Market Center in one! It is! This kitchen is, to say the least AWESOME! It not only caters to those looking for an extensive play kitchen but also features the market setting, allowing multipleÂ imaginativeÂ play ideas! 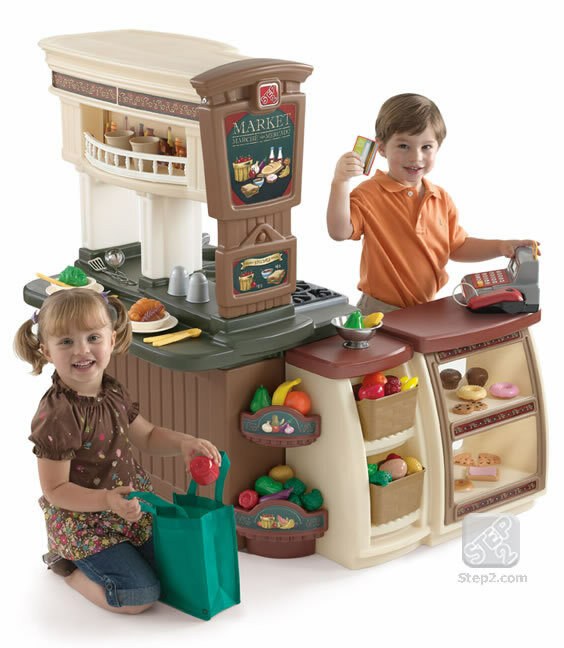 This kitchen is more than large enough for two older little kids to play with and even offers a counter top setting for one child to sit and “enjoy a meal” while the other is in the kitchen “cooking” or “selling” Produce! The Fresh Market Kitchen arrives in 2Â separateÂ boxes. This may seem a little overwhelming but once the boxes are emptied, your Â nerves should calm a little. Â There are 17Â piecesÂ in the box, including the decals, instructions/hardware and bags of accessories. Â There are 30 Steps in the Instructions and they are all very well illustrated which makes it easier for those who don’t like to read directions. ( cough, cough, my husband) Â Step2 also includes a savings pamphlet that includes 2 discount codes, one for 10% off your next order and one for Free Shipping! decal with bottles on it that goes on the front of the counter top area. My Husband attached a trellisÂ pieceÂ that goes in front of where the sticker goes first and this made it hard for me to put the decal on. It took us about an hour and a half to get the Fresh Market Kitchen put together. There are a lot of screws that go into the kitchen to make it very stable Â and the holes are not pre drilled so this takes a little elbow grease. Â But once your done you will be very happy with the results!Â You will also need 2 AAA and 4 AA batteries, for the light, stove top and cash register. 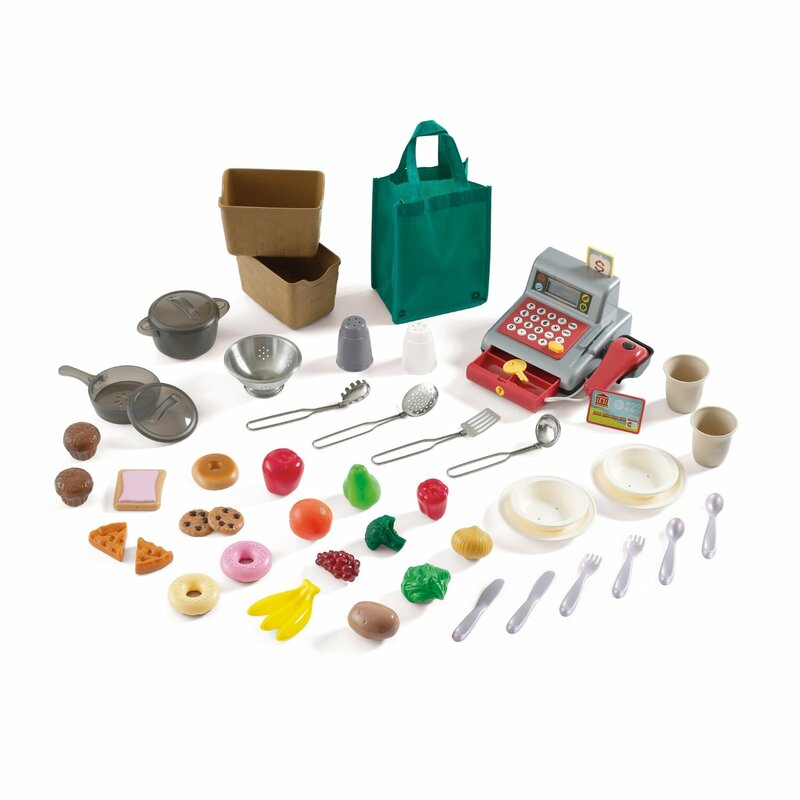 The Fresh Market Kitchen comes with lots of fun parts for interactive play! There is a light above the Stove that can be turned on and off. 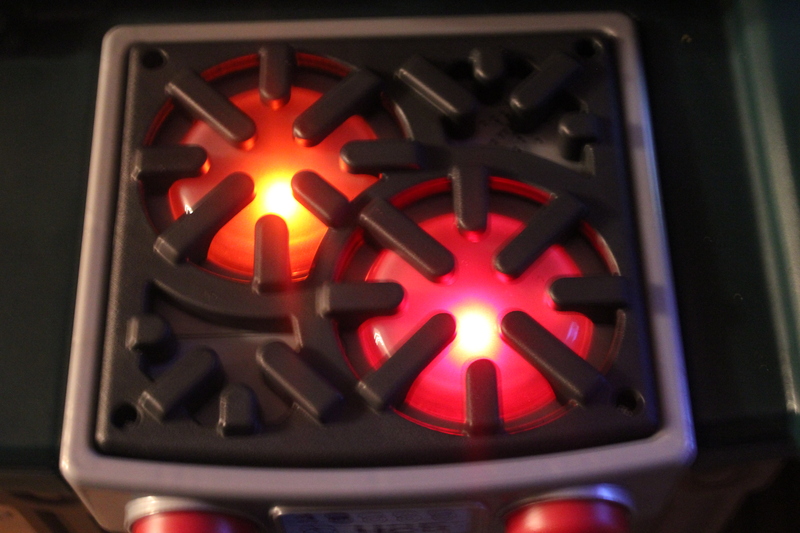 The Stove Top has two burners that light up and make sizzling and boiling noises when the knobs on the front are turned. Â The Sink faucet can be moved back and forth between the shallow and larger sink. There is a display area for fake goodies they can purchase. Plus, The Stove and Microwave both open and close. The Fresh Market Kitchen comes with a large 47- piece accessoryÂ kit as well! This is wonderful considering all these thingsÂ separatelyÂ become expensive and it’s nice that they are included in the set! Overall the Fresh Market Kitchen is Great for kids of all ages! 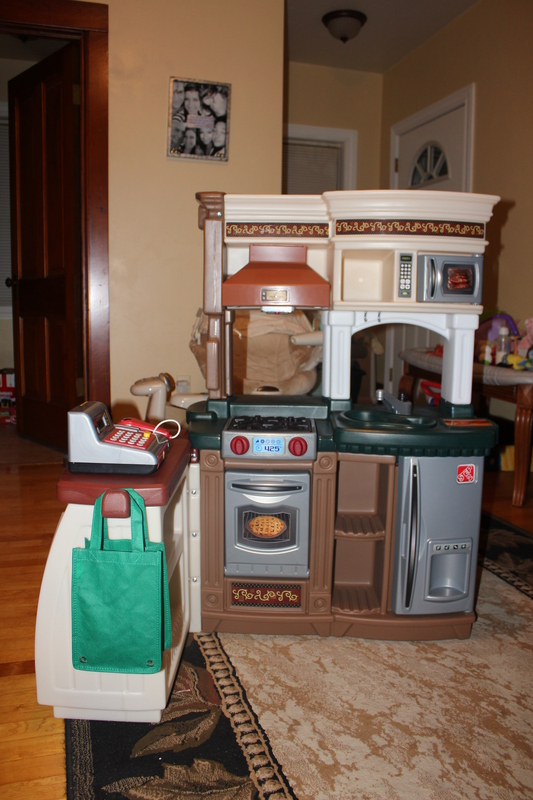 Both boys and girls will have a blast with this gender neutral Â play kitchen. Not to mention they are learning while they play! 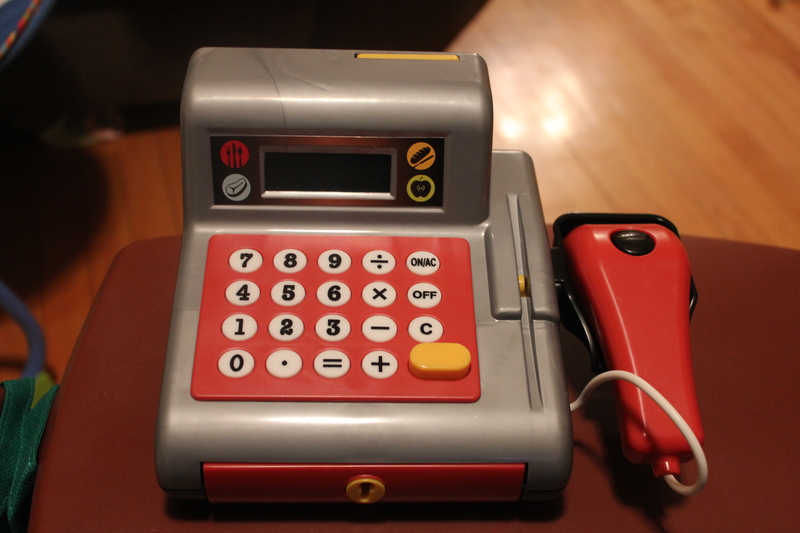 The Cash register is working calculator with a scanner that beeps when placed on things. It’s great at teaching young ones cause and effect with the burners and sounds and you can even teach good manners through showing your kids how to behave while “shopping” or “eating” at the counter! 1- the oven door on the set we received would not stay closed. It would easily fall open and became an issue when trying to play. Step2 is aware of this issue. They told me it is something that happens to the plastic in the cooling process. They don’t have a way of detecting if this will happen so sometimes families end up with a droopy oven door. To fix this, Step2 offers a hardware kit that comes with instructions that they are more than happy to send out to you, should you have this issue! Their Customer Service is impeccable and they are very much all about trying to keep your kids happy! 2- The display area in the front of the market section comes with a plastic sheeting to go over the shelving to make it look like a case. The picture on the site shows this to be really clear and see through, however the one we received is much more milky/hazyÂ and hard to see through. I suppose you could choose to not put that piece on if you choose to make items easier to see; however in good light you can make them out. Besides those 2 small imperfections, the Step2 Fresh Market Kitchen gets The Link Fairy Seal of Approval! To Purchase the Step2 Fresh Market Kitchen Click HERE! Like Step2 on Facebook to stay up to date on the latest Sales and Promotions! Like Step2 on Facebook and Get Â 10% off any Regular Priced Item! This Set is normally $237.09 ( saves you 15%) But drops down to $197.09 with Code-Â LF40FMB Plus it Ships for FREE! This is an awesome value! Hurry though! Code is only good through 12/16/11! If your family is anything like mine, we like ourÂ carbonatedÂ beverages! Sometimes a little too much, costing us a pretty penny in soda every month. Well, if you’d like to be able to put a good amount of your monthly soda cost back into your pocket, I suggest you take a good look at the SodaStream! This handy little contraption takesÂ ordinaryÂ tap water and turns it into fizzy goodness rivaling that of the big sodaÂ companies! The process takes all of 5 min and after that you have your very own carbonated beverage! There are 7 different styles/versions of the SodaStream available. The lowest price model being the Fountain Jet, starting at $79.95 and the highest price model being the Penguin, starting at $199.95. Each model is offered with different package options, depending on the accessories you would like to come with it and how much you are willing to spend. The Directions are nice and clear, which makes start-up a breeze. Simply take the cap off the CO2 tank and insert it into the top of the SodaStream and push it into the machine, and that’s all the set up needed! No batteries or pieces to put together what so ever! After carbonating your water, unscrew the bottle from the SodaStream and choose your flavor! The Machine comes with a 12 packÂ varietyÂ kit that lets you try a good amount of flavors including regular, diet and energy choices. They are premeasured so all you need do is cut the top, angle the bottle and slowly pour. Once the flavoring is in the bottle, cap it off and slowly tilt the bottle a few times to mix it in. VIOLA!! Instant Soda!! SodaStream Flavorings come in 2 sizes, 500ml Â and 750ml.Â Each 750ml bottle of Â concentrate will make 6 liters (approximately 25 8-oz servings) of soda and each 500ml bottle makes 12 liters (about 33 cans) of soda. the 500ml bottles run between $4.99 – $6.99 while the 750ml bottles are $9.99. You can also make flavored sparkling water! 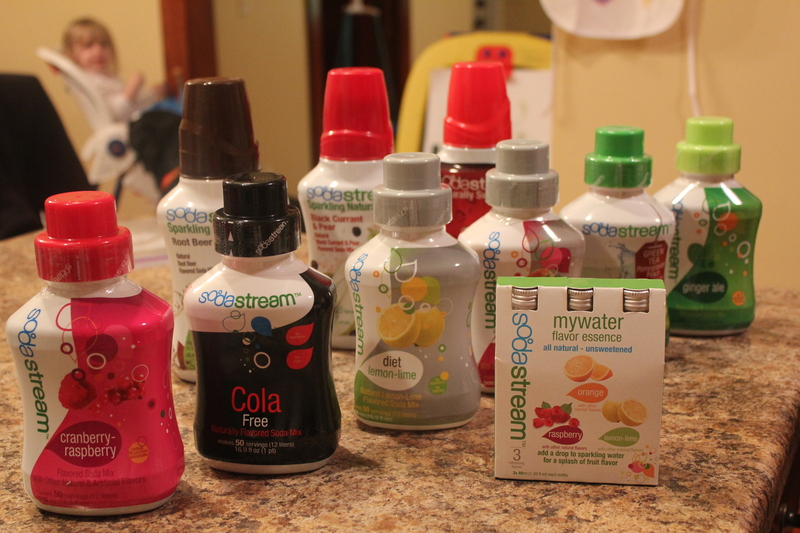 SodaStream offers MyWater flavors all which I thought were very yummy! Out of the flavors we tried, our favorite were, Grapefruit, Cola, Cola Free, Dr Pete, Orange,Cranberry Raspberry and the Energy Drink which has a resemblance to Red Bull. SodaStream also offers Sparkling Naturals, which allÂ contain no artificial flavors, no artificial colors and no artificial sweeteners, and do not contain any preservatives. Also Sparkling Teas with bothÂ CaffeineÂ andÂ CaffeineÂ Free varieties. Once your SodaStream needs more CO2, you can order exchange kits on their website or, to avoid shipping costs, you can purchase a new one at any SodaStream retailer. You can also have the CO2 tank refilled at a SodaStream approved retailer which you can find on their website. Â EachÂ carbonaterÂ will carbonate up to 120ml of soda. 1- It takes a little practice getting the right carbonation. The first time we under did and the second time we over did it. Under doing it is very noticeable, but over carbonating isn’t bad, it’s just extra bubbly. 2- The pre-measured variety packs where very easy to pour and gave great flavor! It takes some getting used to using the Â bottles of flavoring since you need to fill the cap and pour that way. I would recommend using a small funnel to pour the flavors in since they spill easily from the cap. Also, be sure and follow the directions strictly about adding the flavors from the bottle. It’s very easy to over or under flavor and this is reallyÂ noticeable. 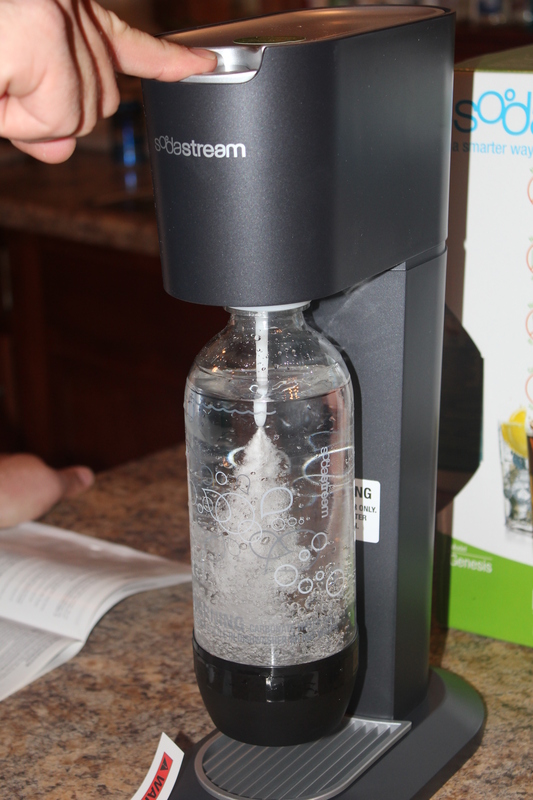 All in all the SodaStream is a wonderful way to have any flavor of soda you choose at your own convenience! Plus it’s a money saver and fun for the whole family which makes it worthy of The Link Fairy Seal of Approval! 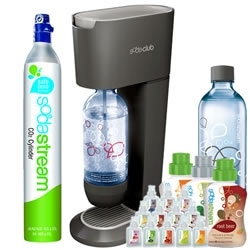 To Purchase your own SodaStream, Click HERE! Use Code- FREEMIX to grab a Free Soda Mix! Be sure and Order your SodaStream by Dec 18th for Christmas Delivery! Like SodaStream on Facebook to stay Up to Date on the latest Sales and Promotions! 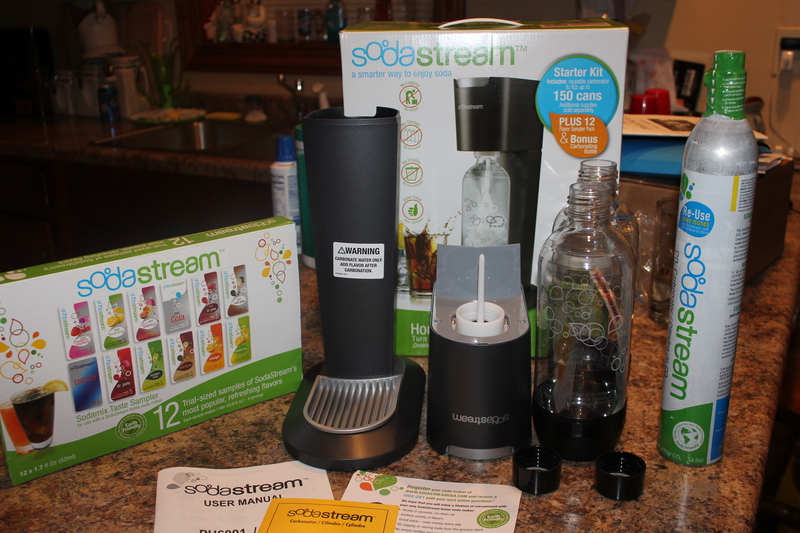 Click HERE to enter to win a SodaStream of your own! Please read all rules on the entry form. Giveaway ends on Dec 17th. Winner will be notified and chosen on Dec18th. Share the Giveaway on your Facebook Page every day for an Extra Entry into each giveaway item! Be sure and Tag Link Fairy so I can count it! If you have a little one struggling with potty training, you know it’s equally frustrating for Mommy and Daddy as it is for the little learner. The Potty can be scary being so big and high off the ground and parents arms can get tired holding their child up waiting for the “magic” to happen. In Steps the Looster Booster from Little Looster LLC! 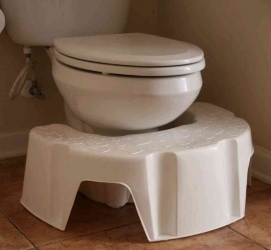 Created by a mother of 3, this U-shaped step stool is made to fit around your toilet, giving little ones that support they need while moving the floor up to their level. The Looster Booster helps with confidence while making the wholeÂ experienceÂ more enjoyable! Â No more falling in or grabbing the back of the toilet seat! The Looster Booster is the perfect height to make sure little ones can keep their balance and get up and down safely. The Looster Booster is made from durable plastic and proudly made in the great state of Oregon! The Looster Booster is light weight, durable, easy to clean and fits around any toilet earning it the Link Fairy Seal of Approval!! To Order your own Looster Booster, Click HERE! The Looster Booster is also now available at Walmart.com! Like Little Looster on Facebook to stay up to date on Sales and Promotions! Click HERE to enter to win a Looster Booster of your own!Â Please read all rules on the entry form. Giveaway ends on Dec 17th. Winner will be notified and chosen on Dec18th. If you are looking to bring a little originality and vibrant color to your glassware, the green glass co. is the way to go! Their glassware spans from tumblers, votive holders and vases to ornate wine glasses and other home decor! They offer lots of different designs, from the simple and plain to theÂ sophisticatedÂ and modern. No matter what your style, the green glass co. will have something to match it! Two of my favorite products from the green glass co. are the Assorted Clear Pop TumblersÂ Set of 4, made from recycled soda bottles and theÂ Mist Tumbler Clear / Summer – set of 4Â made from reclaimed transition bottles. 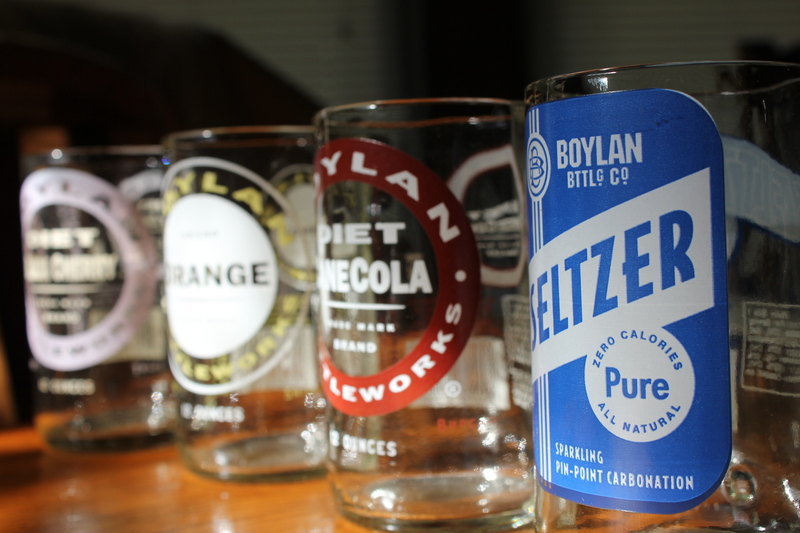 Each glass has been carefully made with a smooth lip and is very comfortable to drink from! The glasses are stunning in person and truly a conversation starter, not to mention good for the environment! Kids will love the vibrant colors and the fun soda names on the glasses in the Pop Tumbler set. The serene background for the Mist Tumbler set will have you feeling like you’re sipping lemonade next to a cool spring in Summer. The glasses wash easily in the dishwasher and since commercial bottles are made with the mindset of needing to be durable, they can withstand a bump or two. 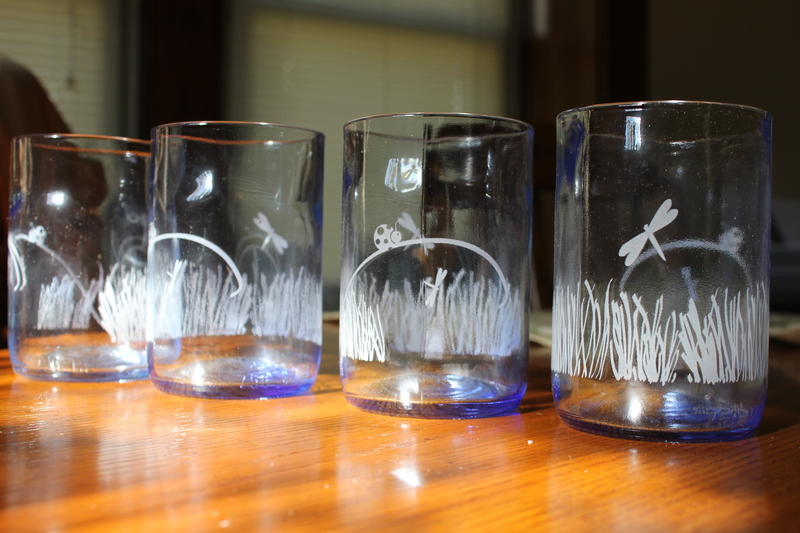 The green glass co is a fun and engaging way to save the environment while being able to own beautiful works of drinkable art; earning them the Link Fairy Seal of Approval! 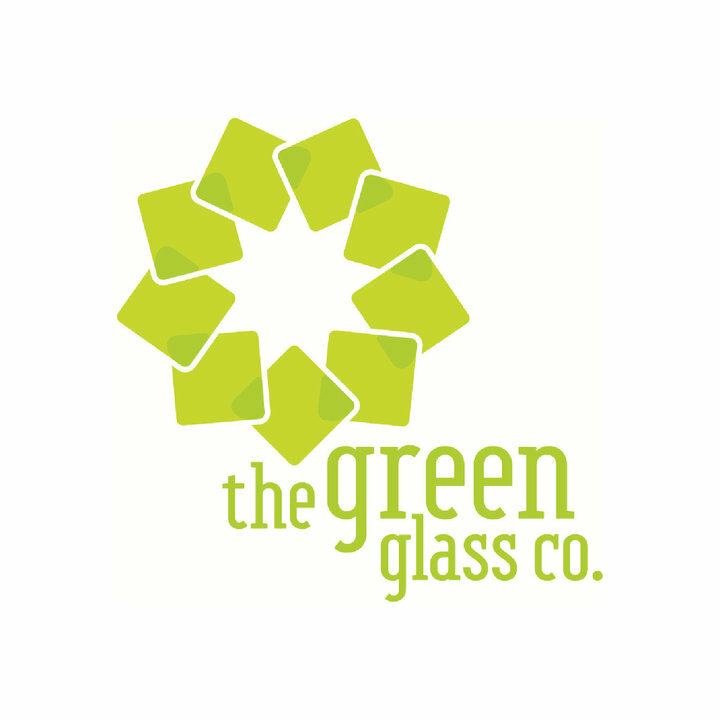 To browse all the available glassware from the green glass co, Click HERE! Be sure to Like them on Facebook for new and special promotions, Click HERE for their Facebook Page! Click HERE to enter to win your own set of Assorted Clear Pop Tumblers!Â Please read all rules on the entry form. Giveaway ends on Dec 17th. Winner will be notified and chosen on Â Dec 18th. Do you remember the old Tinkerbell Peel Off Nail polish?! I know I had some as a kid and loved it, but it soon went away after harmful chemicals were found in it. Since having a daughter of my own I have searched and searched for a product similar to my old peel off nail polish! Well my fellow Peel-Off-ians, look no further! Introducing AllyKats! 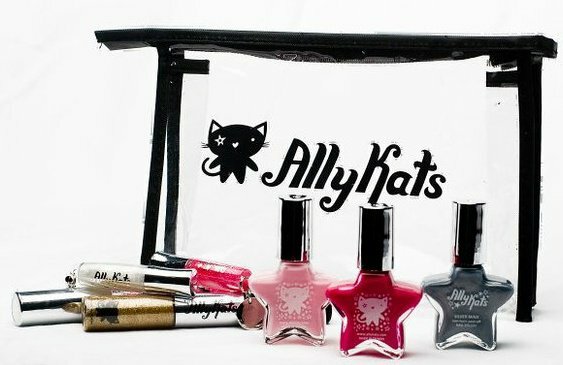 AllyKats offers fun, non-toxic, safe and most of all, ageÂ appropriateÂ make up and peel off nail polish for tweens and little girls! Now your little diva can be just as stylish as Mommy with her own Lip Gloss, Peel Off Nail polish, Eye Shadow/Mascara, Lip Balm, Bath Soap and more! Made from Natural and gentleÂ ingredients, AllyKats prides themselves on being a makeup line for youngsters that will only enhance their natural beauty, not make them look made up or too grown up. After trying AllyKats myself, I’m convinced that this is all I will be buying for my daughter! Â The nail polishes are fun and peel off perfectly! The lip glosses come in full size and mini sizes which are perfect for little hands and they don’t stain lips. The colors are great for little girls, making them look like they are having fun and being themselves but not overdoing it at the same time. AllyKats also offers a fun cosmetic bag to keep their goodies in! Not only is AllyKats a great way to let your little one feel like Mommy or Big Sis, it’s extremely affordable and won’t let you down when it comes to what’s in it. For these reasons, AllyKats gets the Link Fairy Seal of Approval! AllyKats would make wonderful stocking stuffers! To Grab some AllyKats for yourself and browse their other products, Click HERE! AllyKats currently has some items on sale for $1.50 and up! Be sure and Like AllyKats on Facebook to stay up to date on Sales and Promotions! Click HERE to enter to win a random assortment of own AllyKats Products!Â Please read all rules on the entry form. Giveaway ends on Dec 17th. Winner will be notified and chosen on Dec 18th. Pet Lovers Rejoice! Finally an odor eliminating product that not only works, it’s eco-friendly and scentless! NOse Offense is NOT an odor masking agent. This product actually removes the stink left behind from pets and gives you back your home! NOse Offense’s patent pending formula is scientifically proven toÂ neutralizeÂ pet order!Â Â This product really packs a punch! It can also eliminate other smells in your home that are clinging onto any water safe fabrics including curtains, carpets, clothing and blankets. NOse Offense can Â be used in litter boxes, cages, carriers, pet living spaces, and sleeping beds/areas! Plus, NOse Offense can also be used Â on hard surfaces, like wood or plastic! NOse Offense is easy to use, simply spray a few times in the air or Â directly onto the stinky area in question. 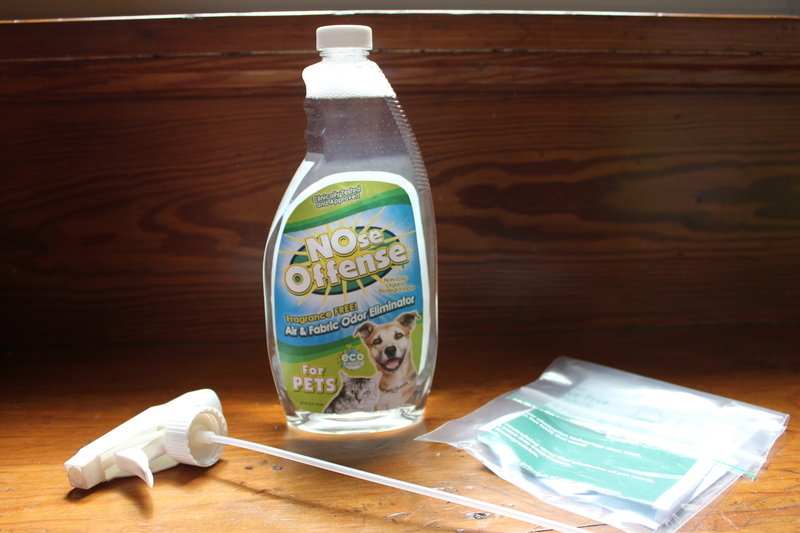 You can even spray NOse Offense onto a cloth and wipe it directly onto your pet to eliminate odors! We have a massive black lab named Captain and if it’s at all hot or wet outside our home willÂ immediatelyÂ smell like “dog”. I can’t rave enough about the wonders of NOse Offense! This product is a god send! It not only holds up its end of the bargain by eliminating odors from pets, but it works to eliminate any odor! It’s even great for the car! We travel with our dog all the time and trips to the dog park can leave the car pretty smelly! NOse Offense is great for spraying all over to get that car back to sniff-worthiness! I love that it’s un-scented. No worries about allergies or nasty smelling, odor masking scents. Plus it’s eco-friendly formula makes it safe to have around little ones earning NOse Offense the Link Fairy Seal of Approval! To Purchase NOse Offense, Click HERE! Be Sure and Like NOse Offense on Facebook to stay up to date on Sales and Promotions! Like NOse Offense on FacebookÂ then Use Code- LINK15 on NOse Offense’s Website for a 15% Discount! Perfect Stocking Stuffer for your Pet! If you have a little one withÂ sensitiveÂ skin or suffers from a skin condition such asÂ eczema, you know it can beÂ challengingÂ to find products that are safe to use with your children. Â Jackie, a mother of 2 felt the realities of this issue with her daughter Madii’s eczema. With Madii’s skin being too young for harsh medical creams and trying to avoid baby washes all together, Jackie needed Â something thatÂ was safe, gentle and would allow her to repeatedly cleanse Madii’s skin during the day without further damaging it.Â Thus she invented the Luxe Cleansing Flannel. The Luxe Cleansing Flannel, is a super soft and incredibly absorbent product created just for use on those delicate areas. It’s great for sensitive skin conditions from eczema and acne to those caused by cosmetic procedures. The Luxe Cleansing Flannel dries without taking away moisture and can be used directly on problem areas to treat skin without hurting any stitches, wetting any bandages, or irritating a bruised area. Jackie was also in search for the perfect pillow for her son, Dylan. Since he would be spending most of his time asleep, she needed something that was natural,Â hypoallergenic, would give support and was easy to clean. Not being able to find these qualities in normal, everyday pillows, Jackie created the Luxe Pillow Collection!Â Made from 100% certified natural latex, and is Australia’s first collection of natural and sustainable children’s pillows. The Luxe Pillow Collection includes 3 different sizes of pillows. the Sooki Babe for infants, the Teenii Tot for toddlers and the Mini Me for children Â 4years +. 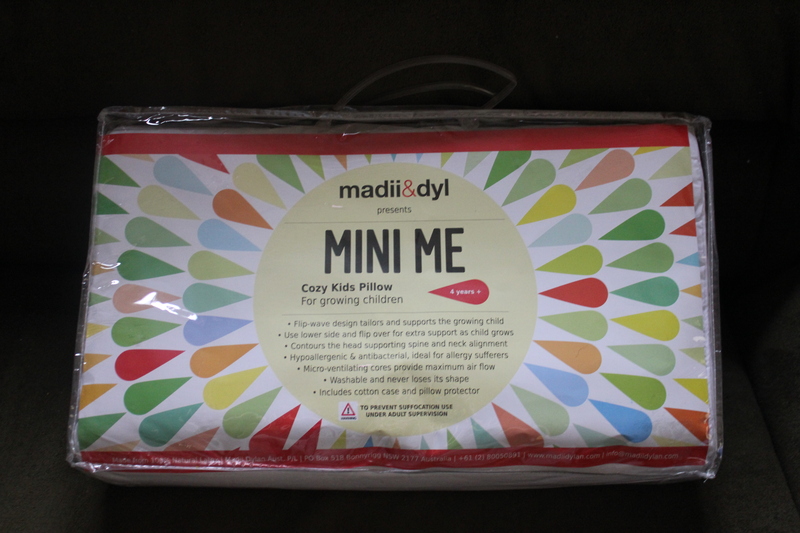 My daughter and I were able to test out the Mini Me pillow fromÂ Madii Dylan Aust. P/L. The Pillow has a unique wave shape that allows for it to grow with the child, giving them the support they need as they get older. The lower side being for younger ages and the higher side being for when they get older. This pillow is impeccably soft and comfortable! I can not describe how much I wish there was an adult version! The outer case of the pillow is nice and soft and the pillow itself easily retains its shape. Â there areÂ Micro-ventilating cores inside the Â pillow that prevent moisture and heat build-up, which is wonderful for keeping your kiddo comfy at night. 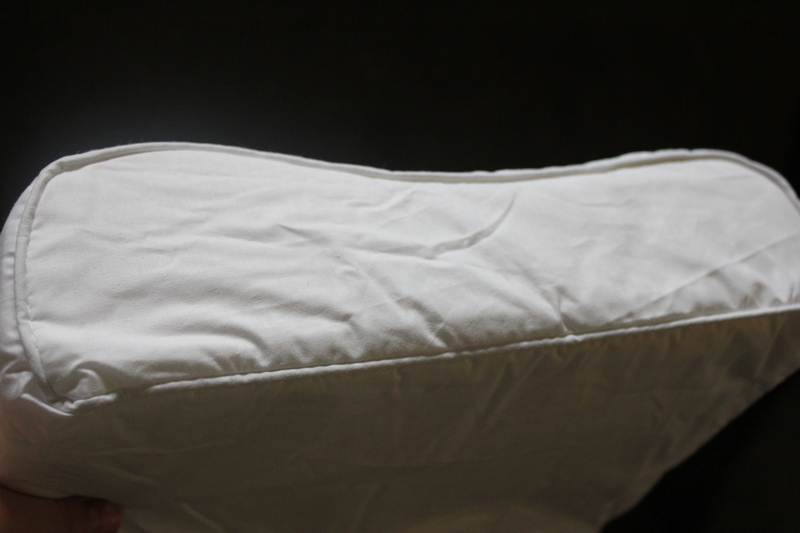 Plus, the pillow is completely machine washable and will retain its shape Â after each and every wash! 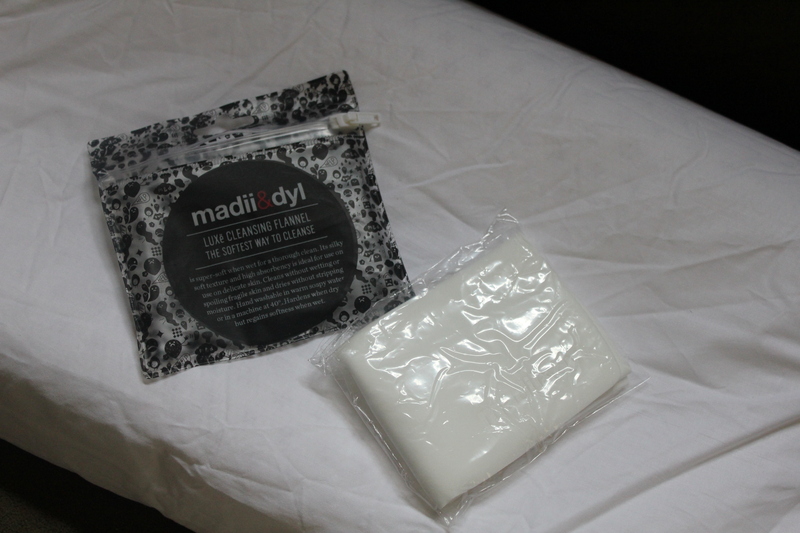 it’sÂ recommendedÂ that you get a new Madii & Dyl Pillow after 5 years of use though. 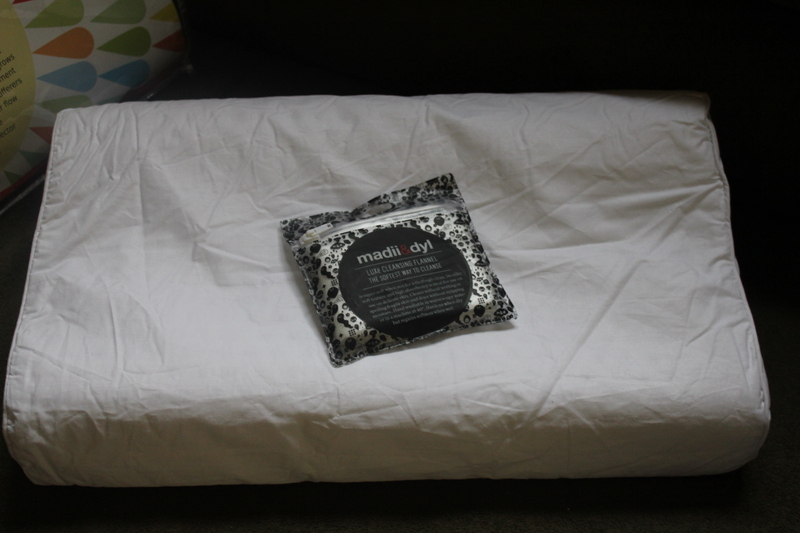 The Pillow is made from 100% natural latex and is ideal for allergy sufferers. The Mini Me is large enough for an adult but would be more the size of a travel pillow compared to a normal pillow size. The Luxe Cleansing Flannel is equally awesome! To use, just pull the Flannel out of the packaging and wash with warm water. The Flannel has been naturally treated with an eco-friendly antibacterial to stop growth of bacteria and mold while in the packaging. Because of this, it will be damp when you take it out of the package. Just rinse it with warm water and it’s ready to use. The Flannel is wonderful for cleaning babies after feedings or for scrapping off dead skin. Use it as a wash cloth and help get rid of cradle cap without irritating the problem areas. You can even use it when dry as a soft towel and simply lay it flat to dry! The Flannel is great for adults also suffering from skin problems or for those with cosmetic/postÂ operativeÂ skin issues. it can even be used to remove excess oil or makeup! It’s easy to clean, just use warm soapy water or put in your machine at no more than 40 degrees. The Cleansing Flannel willÂ Harden when it dries to prevent bacteria but will regain its silky softness when wet again. 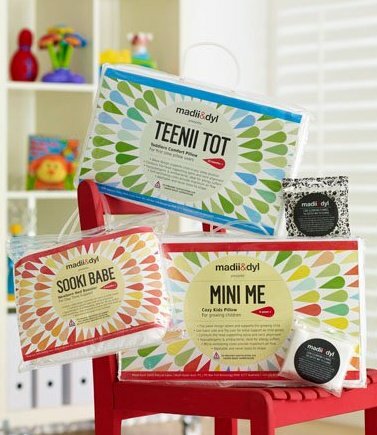 Â Madii & Dyl Range Products have been used by celebrities and concerned moms and dads all over the world. Their attention to detail when it comes to theÂ sensitivityÂ of children is unmatched and for this Â they’ve earned the Link Fairy Seal of Approval! To Purchase a Madii & Dyl Range product, Click HERE! Like them on Facebook to stay up to date on new sales and promotions! If your little one is like mine, she loves to brush her teeth! So much so, that her tooth-brush gets dragged around all over the house! I have gone through multiple tooth brushes in one week because of nasties getting onto them and it’s become a little of an expense. So when I was sent a Zapi from Violight I was over joyed! This fun little contraption uses UV light to sanitize your tooth-brush, giving you a clean, bacteria free brush every time! No more trips to store for that tooth-brush getting dipped in the dog water! Simply rinse it off and pop it in the Zapi upside down, hit the start button and let the Zapi work its magic! 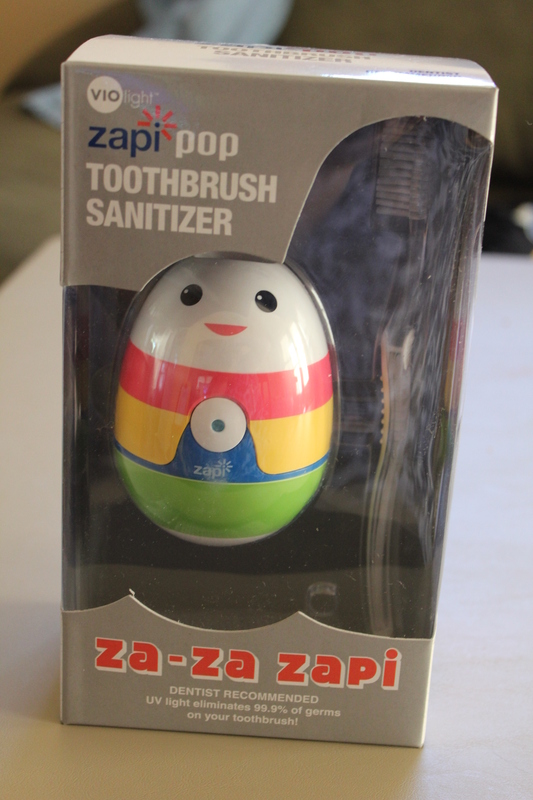 It takes about 7 min for the Zapi to automatically shut off but afterwords you have a 99.9% germ free tooth-brush! The Zapi works with all kinds of brush heads, including electric ones! The Zapi comes in 7 different styles and designs and certainly appeals to little brushers! Plus it comes with a Tooth Brush! You will need 3 AAA batteries to run your Zapi. Violight also offers other forms of tooth-brushÂ sanitation products, from travel size to ones for the whole family and even a dental sanitizer for dentures, retainers, whitening trays and more! They also makeÂ SanitizingÂ products for cell phones! After using the Zapi, I am certain that brushing will never be the same. Being able to brushÂ every timeÂ with an almost brand new tooth-brush is wonderful for you health and keeps me confident my little one’s mouths are getting clean! For this, the Zapi has earned the Link Fairy Seal of Approval! To Purchase the Za-Za Zapi and other Violight Products, Click HERE! Â Like Violight on Facebook to stay up to date on new sales and promotions! Use Code- ZAPIFREE11 For a Buy 2 get 1 Free Deal at Violight.com! Click HERE to enter to Win a Zapi of your Choice!Â Please read all rules on the entry form. Giveaway ends on Dec 17th. Winner will be notified and chosen on Dec18th. If you areÂ desperateÂ forÂ closetÂ organization I’ve got the perfect solution! Huggable Hangers by Joy Mangano! Huggable Hangers are extremely thin and lightweight. They are covered in aÂ Velvet-flocked material whichÂ convenientlyÂ clings to clothingÂ so they don’t slip off Â and also allows for heavy winter clothing to stay on the hanger. You can even put wet clothing on them to dry and not worry about colors running. Plus they have nice long hooks so you can hang your turtle necks and scoop neck garments with ease! The Huggable Hangers have a gentle curve to them eliminating that unwanted “shoulder bump” look that traditional hangers can give clothing that has been hung. 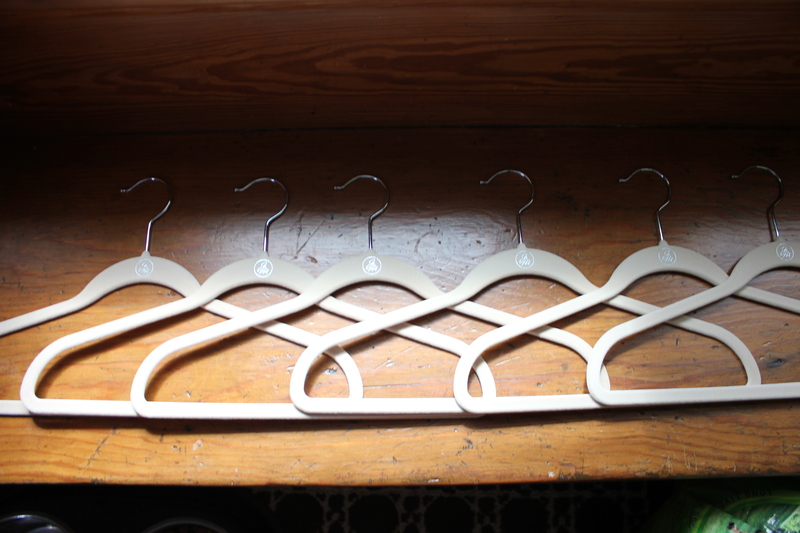 The thin design of these hangers allows you to closely hang garments, conserving closet space and letting you hang twice as many items as traditional hangers! Huggable Hangers come in a variety of package sets. The least expensive being the 24-piece set at $24 and the most expensive being the 100 pack set at $115. I really was amazed by theÂ amountÂ of space saved by these hangers! The Velvety material on the outside really helps to keep those pesky silky or thin strapped garments from slipping and the slight curves flow with the natural shoulder shape of clothing. 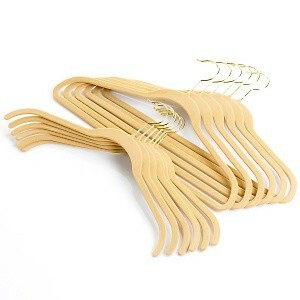 They are very light weight and make normal plastic hangers seem bulky and cheap. 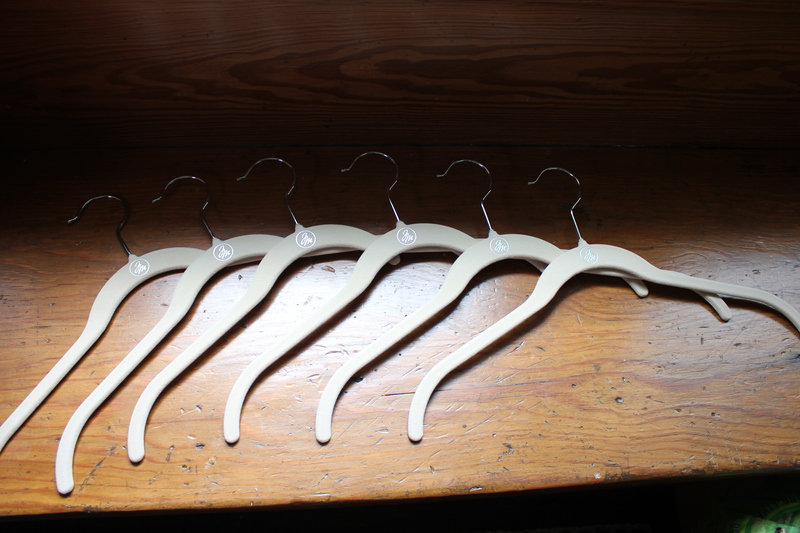 Huggable Hangers would make the perfect gift for anyone needing more space! And who doesn’t need more closet Space! For this Joy Mangano Huggable Hangers have earned the Link Fairy Seal of Approval! To Purchase Joy Mangano Huggable Hangers, Click HERE! Like Joy Mangano on Facebook to stay up to date on New Products, Sales and Promotions! Every woman with kids wants nothing more than to show off her sweet little bundles smiling faces! With Braggables, you can stylishly show the whole world your favorite moments! Braggables creates high quality photo accessories, key chains, bags and more! They even offer and iPad Case! My favorite item they offer are their purses. I know both my mother in law and my own mom carry multiple pictures around with them in their purse of my kiddos. Well now you can let grandma easily show off her grand babies without the worry of photos getting ruined! There are 11 different styles of Braggables purses. 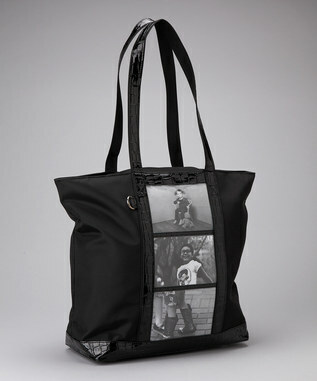 The lowest priced being the single photo, Cotton Canvas Mini Tote at $24 and the most expensive being the 3 photoÂ ExecutiveÂ Tote at $66. You can choose your favorite by how big you want your purse, the style and how many photos you want to have. They even have feet on the bottom to protect the bottom of your bag! 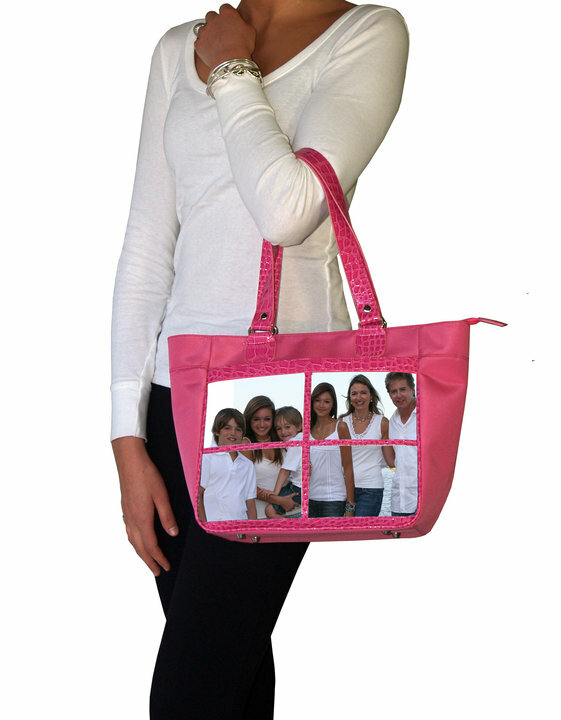 The Photos fit snuggly and safely in a zippered window pocket on the front of the bag. Â Braggables are made from quality materials and fabric and are sure to turn heads! These bags are beautiful! They are fully lined on the inside and have spaces for your phone, change and plenty of space for extras. The materials look and feel like something from a Â high-end store! No matter which Braggables you choose, you are sure to love it! Braggables make the perfect gifts to family members and are wonderful for showing off your kids, dogs, wedding photos and anything else you would like! For this, Braggables has earned the Link Fairy Seal of Approval! To see the entire Braggables line of products, Click HERE! Like Braggables on Facebook to be kept up to date on New Products, Sales and Promotions! Well that concludes my 2011 Holiday Gift Guide! I hope you enjoy exploring these products as much as I have! Happy Gift hunting and have a Very Merry Holiday and Happy New Year!